Female fighters in the Syrian civil war are foremost associated with the Kurds, in particular the YPJ division of the Democratic Union Party (PYD)’s armed militias. Indeed, a female role in fighting fits in naturally with the secular and leftist ideology of the Kurdistan Workers Party (PKK), of which the PYD is the Syrian affiliate. However, the phenomenon of female fighters and militia members is not confined to this side alone: they can also most notably be found on the regime side. In fact, such a case came to light recently with the killing of one Ghasun Ahmad, who died fighting on the Aleppo front in late August. 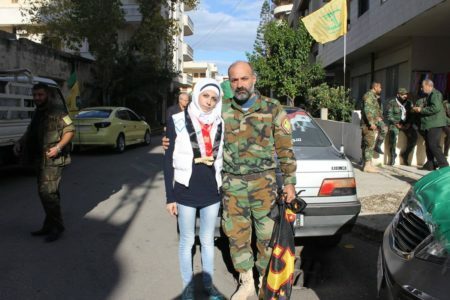 Also known by the nickname Amirat al-Assad (al-Assad Princess), she was originally from Tartous governorate and was most notably affiliated with the National Ideological Resistance, a Syrian Hezbollah militia that originates from the Tartous and Masyaf areas and has fought in most parts of western Syria. This affiliation became particularly apparent in footage broadcast by Sama TV of her funeral, featuring the appearance of National Ideological Resistance insignia and outfits at the proceedings. Other posts on social media claimed she was in the ranks of the military intelligence militia Quwat Dir’ al-Amn al-Askari. It is possible she was affiliated with both groups at the same time. After all, the Syrian Resistance has claimed overlap with the ranks of Quwat Dir’ al-Amn al-Askari on the Aleppo front. Ghasun Ahmad in Khanaser, an important point for the regime’s supply route to the Aleppo frontlines. She is wearing National Ideological Resistance insignia in this photo. Ghasun Ahmad with the National Ideological Resistance. “The faction Labawat al-Jabal was formed in the seventh month last year [July 2015] by recommendation from the Brigadier Wafiq Nasir, leader of the military intelligence of south Syria. It is a faction exclusive for women who desire to enlist, and they have been subjected to three training sessions at the hands of officers from the military intelligence branch as their numbers have exceeded 30 young women. But strong opposition to this faction has appeared from a wide section of the people of Suwayda’. Among those who opposed this faction was the previous leader of the ‘Rijal al-Karama’ movement Sheikh Waheed al-Bal’ous [assassinated in September 2015] who attacked them and said it was shameful for women to bear arms so long as there are men defending the province. On the other hand, a portion of the people of Suwayda’ welcomed this faction and said that it is obligatory on every woman to train for use of arms in the face of the gradually growing danger that the province is witnessing. It should be noted that a number of the women in this faction tried to attack the recent demonstrations that this province witnessed to demand improvement of living circumstances, through provoking the demonstrators and vilifying them, but the demonstrators did not react towards them [referring to the small anti-regime ‘Hatamtuna’ protests in Suwayda’ earlier this year, the campaign name meaning “You have smashed us”]. As it so happens, Labawat al-Jabal has a Facebook page in which it announced the opportunity of registration for these training sessions during the summer. Like many other militias, Labawat al-Jabal offered connection for inquiry and further information via phone number, with the place for registration located at the base of Madhafat al-Watan [“The Homeland Guest House”: also just called Madhafat Watan] in Suwayda’ city, which as an institution engages in a variety of activities in the province including financial assistance for students and honouring those who have fought and/or died for the Syrian army. These activities include maintaining relations with key regime figures in Suwayda’ such as the provincial governor. The Labawat al-Jabal sessions during the summer- referred to as ‘the fourth session’ (al-dawra al-rabi’a) and acknowledged to have been supported by Madhafat al-Watan– were subsequently promoted on the group’s page with photos of training, as per below. 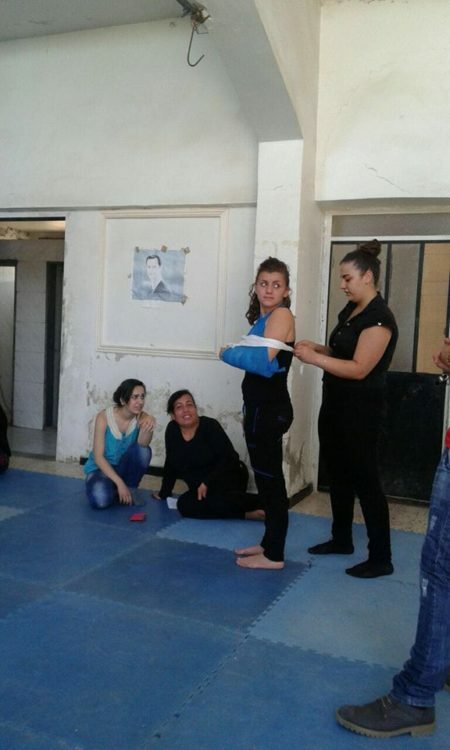 First-aid training for Labawat al-Jabal. “Maha al-Atrash, who is a graduate of the Higher Institute of Dramatic Arts and a musical composer, established it [the Labawat al-Jabal initiative] on account of her belief in the role of women in protecting the land and homeland, and so that it should be an auxiliary for men in defending the homeland, so she prepared a group of instructors, including a close combat instructor, an instructor for street fighting, an instructor for self-defence, an arms instructor to teach how to deal with arms and teach use of rifle magazines, and a first aid instructor, as well as training the woman to confront disasters and teaching women to prepare food for fighters. 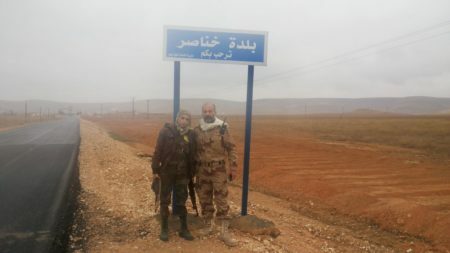 Labawat al-Jabal is by no means a major militia force in Suwayda’ province, which, according to one source in Bayraq Al Kiwan who spoke with me in May this year, is now host to more than 35 factions. Nonetheless, it offers an interesting case study of female militia mobilization and its political connections within regime-held Syria. Whatever resentment there might be towards Labawat al-Jabal among those who lack the regime loyalist inclinations, full-blown war between the Suwayda’ factions remains a remote prospect, as no one side would emerge decisively victorious. In addition, incidents such as the Qadisiya al-Janub rebel offensive in Quneitra province last month that pushed towards the area of the Druze village of Hadr only served to draw attention away from internal quarrels as forces mobilized to defend Hadr out of Druze solidarity, whatever assurances might have been made that the intention was not to capture Hadr itself. According to a media director for Rijal al-Karama who spoke with me, this mobilization to defend Hadr included fighters from Rijal al-Karama though not going under this name on account of problems with the regime’s intelligence apparatuses. 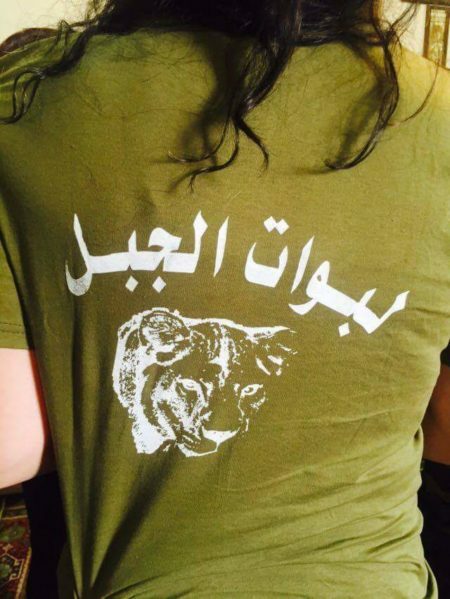 In any event, hopes of the ‘revolution’ coming to Suwayda’ remain a long way off. What to say? How sad that she died fighting for her belief. Just another statistic in the horrors of war, regardless of where one stands. This war, being fought mostly by foreign mercenaries on the one side vs Syrians on the other, will just be another addition to the history books of how the powerful victimize the weak, how greed of one side, willingly destroys the other. And for what? The ideological BS pumped out that one side is good vs the other side being the villain. Will the destruction ever be replaced? The answer is no, as we have witnessed countless times to date, through this so-called “war on terror”. Rebels and their supporters made fatal mistakes since 2011 and have lost crucial support in Syria and failed to earn the trust and respect of their own allies. The challenge from day one was to give Syrians enough reasons to jump ships and thawrajiyyeh lost the challenge, the rest is details. Isis will not give Mosul easily, they are likely to use chemical weapons and wage terrorist attacks in Turkey and the West. The defeat of isis will pressure the GCC and Turkey with a variable support from NATO to rehabilitate islamist rebel factions as a more acceptable form of jihad against Russia, Iran and their allies but the fuel as usual will be arab and Muslim blood. In looking for a victory rebels may attempt to assassinate a major political figure. It was never a revolution. their own banking system with a strong gold dinar currency. Why is IS marketed as an almost normal company? They take cities when they want, withdraw when it suits others, happen to know everything about oil extraction, engineering and marketing. Just by miracle? The responsibility to protect Yazidi or Nigerian girls is entirely left aside, as if women lives had no importance for our Western males ruling the world. The only real danger, do we read these days, is that fleeing IS territories, the djihadists might commit more bombings in the West. But what kind of “West” is that, one with an ideology where women do not exist, at least on the international level? Idleb is now Syriastan and a mirror of Raqqa where Isis HQ is. Rebels who agree to lay down their weapons are sent to Idleb with their families. There are people who called this sectarian cleansing but the truth is that Syria as most of the world, not politicians, wants it to be is different from what Islamists, Isis and nusra want. Darwinism at work here and a potential partition of the country where those who want to enjoy the blessing of Middle Ages life can go to idleb and other areas that treat women like furniture !! The United States Empire – is finally receiving his comeuppance. But the only problem is the mentally deranged bully possesses WMD’s that can, in fact, destroy the entire global village. Since he knows his days as top dog are over and he feels he has nothing left to lose since he’s going down anyway, will the bully follow through on his threat to bring down the entire planet with him? That’s the big question. So now the ISIL is being forced out of Mosul Iraq, back to Syria @ Idlib, compliments of the west. Building up the loses incurred from the Russian/Syrian and friends, shows just how serious the west/Nato is about the war. I wonder, after the final shot has been fired, will all the towns that have been turned into ruins, be abandoned and left to rot in the sun, as a reminder of the stupidity that caused such destruction? Speaking of women heroes, there’s been an Asma sighting! As part of the wonderful “Wesistance Pro™” movement that includes Russia, Iran, and Hezbollah, I look forward to her important contributions in discrediting the Zionist Apartheid Project. Syrians could compel you to face the tribunal and you will pay not less than Gaddafi for Incident at Lockerbie. Joshua Landis: Assad’s man in Oklahoma. I read the attack on Joshua Landis (linked by Tara) by an unknown writer who may very well be an ikhwanji dude obsessed with this blog and its author. It is ok to disagree with joshua but he was right on this war when most ” experts” and thawrajiyyeh were wrong and getting busy blabbing about the regime’s impending fall and how minorities will be punished. Rebels committed numerous war crimes against minorities and are aligned with Nusra, and Turkey has invaded Syria and supported terrorism and just yesterday has murdered over 150 kurds in north aleppo but our thawrajiyyeh friends were more quiet than a house mouse on the subject while being quick in accusing Dr Landis of “promoting sectarianism” just because he stated his opinion and tried to remind the audience about the Iraqi disaster which interestingly enough was due to a sectarian shia regime attacking iraqi Sunnis, our thawrajiyyeh friends have advocated a similar strategy and lobbied the West to make the same mistake with sectarian Syrian sunnis taking the role of sectarian iraqi shia !! What was said in 2012 by landis and others is still true today, there was potential for the uprising to become a national movement but islamists and their backers never wanted a democratic and free political system, they were obsessed with vengeance and fighting iran, and the fire of hatred burned its creator after it ran out of targets !! Look in the mirror before throwing rocks at an academic figure who dared to speak his mind. “As things stand, I must admit begrudgingly that Jaish al-Fatah has fulfilled many goals of the Syrian revolution in Idlib, thereby claiming a greater share of revolutionary legitimacy”. To many of us, Taqiyya practicing ” moderates” in the opposition, and I am not sure if Ghanem is one or not, are worse than Nusra because they are educated, understand the media and can say something to western audience while promoting sectarianism and violence and apologizing for or cheerleading terrorists in action. I completely agree. Assad knew it and he outsmarted all of them. He knew Saudi Arabia would get involved to try to push away Iran’s influence, He knew Turkey was obsessed with helping the Muslim Brotherhood. He knew Alqaeda and Isis (two of his own puppets) would march in if he created stories of “sunnis getting massacred”. He created the conditions to make all of this happens so he can distract the world and discredit the real opposition. He succeeded. Whom really protects “Euphrates Shield” ? On the morning of October 19 Kurdish forces managed to move forward and to free from ISIS several villages to the east of the of Marat um-Hosh village and came to Shakba lake. During the offensive, was taken about 15 square kilometers of territory. Our reporters took a video when liberated the Kurds villages were under fire. According to them, the firing was carried out by the pro-Turkish groups operating with the support of the Turkish army in the framework of operation “Shield of the Euphrates.” In the sky circling aircraft and drones. You are making very weak arguments defending JL. I ask JL to post this in the main post and then defend himself . No defence required, Bless You!! Assadism and Putinism school of thoughts have already changed the course of humanity. Terrorist organizations affiliated to Turkish and Saudi regimes targeted on Sunday al-Hamadaniyeh area and al-Assad residential suburb in Aleppo city with shells that contained toxic gases. More than 35 people suffered suffocation due to the attack, which was launched by the terrorist organizations positioned on the western outskirts of Aleppo city. To Alan # 22, how sad this war is turning out to be for the innocent ones. Regardless of which side one roots for, these latest tactics deserve prosecution @ the Hague. Will it happen, NO, because of the leadership. I wonder who’s producing those poisoned weapons of war? Few points, it is obvious that the battle for aleppo has too many hands, and most big powers do not want a clear winner there. Putin’ decision to mostly watch and let Nusra attack western aleppo is an ominous sign of things to come despite the fact that I think the russian Air Force will join the fight soon. Rebels have been shelling civilians in aleppo for years and that has intensified lately but boneheads on the thawrajiyyeh side do not think that this is a war crime !! I have talked about this issue since 2013, both sides committed war crimes, and the lack of access to jet fighters by rebels is the main reason why the regime killed more civilians not the lack of intent. Rebels shelled civilian areas in almost all Syrian cities. There will not be a Hague tribune for war crimes in Syria, I said that in 2012 and that is still true today. so The Newton’s third law may go active! The deployment of US Marines in Norway is aimed to the implementation of the Prompt Global Strike concept. Sad but True. Smb wants WW3. Please, No need to consume the prestige for obtaining approval to achieve your goals, in overwhelming elimination of terrorists in a modern warfare. Did anyone ask you for bombing Yugoslavia, Iraq, Libya? Did Saudi Arabia ask you allow 4 bombing Yemen? You have a joint operations room, with Iranians, Iraqis & Syrians, to crush terrorism on every square millimeter of the Syrian map. Just a couple of special operations with the help of a microwave and Daesh + Al-Qaeda turn into fertilizer for the soil. The unity of the Syrian territory is a sacred subject from the Lord. The depth of social, moral, ethical and IQ divisions in Syria isn’t illustrated just by thug militia groups. There’s a smug class of young Syrians safely sitting out the war in cafes in Damascus and other Assad-held zones. They feel the war has nothing to do with them, and that those affected are just losers. There was a revealing interview with four of these on the BBC Radio World Newshour a couple of days ago. Among other things, the interviewer probed them on whether they and other young men in their families had been called up to fight in the army. No, no, they said as if it was a stupid question. Explaining that they were exempt from being called up because they were “studying”, had paid $8,000 or were the only son in their family. Asked why they hadn’t left, they said there were two categories of people who had left Syria. Those who were forced to, and those who decided it was a great opportunity to get to live in the west. (I’m sure if asked they would have insisted that 100% of those forced to leave were displaced by ISIS). Sounding amused, they said knew many in the second category who had joined the ‘refugee route’ to Europe only to be disappointed with life there and come back to Damascus. So there we have another group which will have a bad smell in post-Assad Syria: the parasitic ‘smugs’ as well as the nasty thugs. He’s a very rare voice in the media clutter and junk. A real Syrian who’s actually lived the life there and knows the score. I won’t pick up a stick and join you in beating JOSHUA LANDIS. From reading this site for over 10 years, I can say he is decent, sincere, non-cynical and has made a very sympathetic and worthwhile contribution on the subject of Syria. But I have also seen him be naïve, over-loyal and influenced by some people. Which I read to be a downside of his character. That article characterizing him as ‘Assad’s Man’ is hard, but he has been slipping off his balancing beam – but not for ideological or political reasons. I believe that’s likely a result of hanging out with friends like EHSANI, who go back a long time before the war. TARA, I would suggest that in the Syrian war we are all now surviving in our own emotional and intellectual lifeboat, battered by conflicting storms of what we know, what we feel as well as what our own Syrian family and friends are experiencing and doing. Dr Josh in this just like the rest of us. I will always defend him for having a genuine love of Syria and its people. Which is why I do not see him as a calculated pro-Assadist with something invested in the regime, unlike some others we read here. Let it be remembered that Joshua Landis on this site was unique in giving support and publicity to Yassin al Haj Saleh (above) and other anti-regime dissidents in the past. He respected and liked them and gave them a voice. That says more about who he is than the dirty mud and muck of the debate on the war.